It controls your everyday life. Fear can paralyze you both physically and emotionally. I’ll never forget a story a friend told me when she was sharing one of her personal fears. She told me about four young children playing on railroad tracks. While they knew they shouldn’t be there since the railroad tracks were still active, they continued to journey along anyway. With little time to react, the children saw a train coming. The decision was to jump off the railroad track (which was on a bridge at this point) or get hit by the train. Two of the kids jumped. Two of the girls were paralyzed by fear. They couldn’t move. They couldn’t control their own body because their mind was so full of fear. Their decision wasn’t really a decision. Fear made their choice. I blame shark week, the movie Jaws, and the news stations reporting on shark attacks for my extreme fear of getting attacked by a shark in the ocean. Heck, I often thought I could get attacked by a shark in the lake. If I would fall off the jet ski or tube, I’d absolutely freak out. I would hold onto the tube even if my bottoms flew off and I was upside down just to avoid kicking my feet like a frantic fish in deep waters. For the longest time, I wouldn’t go into the ocean. And I would have extreme anxiety if Justin or my Dad was out there on the boogie board. “YOU WILL LOOK LIKE A SEAL AND THE SHARK WILL EAT YOU WHOLE!” I would scream at them bouncing on the waves. Irrational, maybe. Fear driven, absolutely. I told every single local person I met about my fear of sharks. And they all had the same response. Never heard of a shark attack in years. You are way bigger than most of the fish they are used to seeing you actually SCARE them! They are just as curious about you as you are them. I’ve never seen a shark in my whole life and I’ve been scuba diving many times. If you get attacked by a shark on the dolphin tour, I’ll give you your money back! So I realized something. You can get over a fear just by talking about it. Hearing what other people have to say really helps in a lot of situations. Especially if you are getting your information from certified scuba divers and jet ski dolphin tour guides. And fishermen. 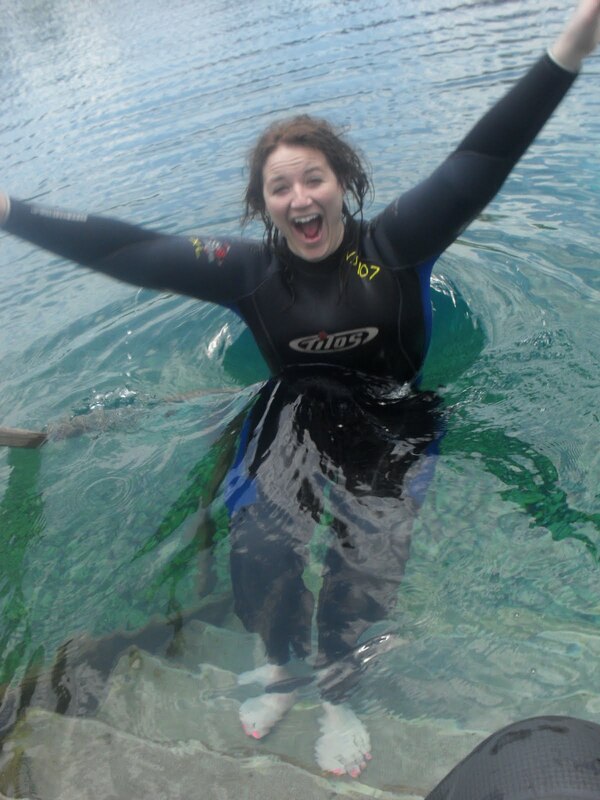 I went scuba diving in the ocean. I went on a jet ski dolphin tour. And most importantly, on the very last day I HUNG OUT in the ocean. I rode the waves to shore! I swam out probably more than 100 feet to a sand bar! I watched a fishermen catch a 2 foot baby shark. The answer was yes. So my mind was made up. It’s time to conquer this fear and get on living my life. I’m not saying that I want to go on a shark feeding tour anytime soon, but I’m definitely down to swim a few waves and take more jet ski trips in the ocean. So whatever your fear is, look it in the eye. Talk about it. Learn about. Grow from it. Life is to short to live in fear. <3 such a brave girl.